Local Composer has World Premiere in Canberra! Have you heard of Michael Dooley? Well you’re about to … Michael Dooley is a Canberra composer and pianist, and can usually be found with jazz duo In2Deep or conducting local choral group Rhythm Syndicate. But, on Saturday 20 May Michael will be the focus of Canberra when his Piano Concerto No.1 has its world premiere! Sydney-based pianist Andrew Rumsey returns to Canberra with a collection of esteemed colleagues for an evening of unforgettable music. Joining him will be Mia Stanton (violin), James Larsen (cello), Tom Azoury (clarinet), Laura van Rijn (flute) and Matt Withers (guitar). Pieces will include works by Rachmaninov, Debussy, Williams, Kovacs, Piazzolla, Edwards, Clarke, Dooley and more. This concert will be Rumsey’s final engagement in the ACT before he begins his USA tour, starting with an appearance at Carnegie Hall on 3 June 2017. “I am delighted to be giving the world premiere performance of Michael Dooley’s Piano Concerto No.1,” says Andrew. “Michael has such a fresh and unique compositional style and I’m so excited to be sharing this amazing work with Canberra. It has all the right ingredients; lyricism, tenderness, subtlety, virtuosity, and power. Definitely a captivating piece to listen to, and perform!”. Rumsey & Friends New Directions will premiere on Saturday 20 May at 7pm at the Wesley Music Centre, Forrest. Tickets available from Eventbrite. You can also hear more of Michael Dooley on Sunday 21 May when ART Song Canberra presents The Voice of Heroic Love with well-known Canberra soprano Louise Page, Rachel Best Allen on clarinet, and Phillipa Candy on piano. This work will also include a new song cycle composition by Michael Dooley. The Voice of Heroic Love, Wesley Music Centre, Forrest, Sunday 21 May at 3pm. Tickets at the door from $15 (students), Art Song Members $25, Concessions $30, Full price $35. Tickets include program and light refreshments. For more information contact Art Song Canberra on 6286 7373. You can follow Mike Dooley on his Facebook page. This entry was posted in LFW Your Canberra and tagged Canberra composers, Canberra jazz, Canberra music, Canberra singers, In2Deep, Louise Page, Rhythm Syndicate, Wesley Music Centre on May 10, 2017 by gracienumber1. LFW took a drive out to the country on the weekend, and joined the sunshine, crowds, apples, and music at Loriendale Orchard Apple Day on Saturday 1 April. Loriendale is a boutique orchard with over 120 varieties of apples, as well as selection of nectarines, peaches, nashi pears, berries and nuts. The orchard runs organic best practice, which means that the fruit actually tastes like the fruit you may remember from your childhood, before all the GM, gassing, spraying, and cold storage. Apple pies, toffee apples, jams, jellies, chutneys, sauces and relishes were also on offer, together with amazing apple based afternoon teas for just a few dollars. The farm was purchased by the Pidgeon family in 1982 but it wasn’t until around 1997 that the apple and cherry trees were planted, and the orchard was established. The farm is also a WWOOF (Willing Workers on Organic Farms) hosting farm; providing the opportunity for young people, from around the world, to live and work on the farm and learn about agriculture, farming, and a bit of Australian culture. But, one of the best things about the Apple Day was sitting in the sun with our afternoon tea, and listening to some cool jazz from local group Rhythm Syndicate. This great vocal group has been performing in Canberra and the region since 1990, and offers a mix of cool jazz, gospel, classics, and popular. The mixed group sings in four-part harmony, accompanied and a cappella, and includes talented muso and vocalist Paul Herbert on harmonica and flute, brilliant pianist and composer Mike Dooley, and is pulled together by director and conductor Camilo Gonzalez. You can hear them next at the Merimbula Jazz Festival over the June long weekend. Loriendale Orchard, Carrington Road, Hall www.loriendale.com.au. You can also find Loriendale at Capital Region Farmers Market every Saturday from 7.30 – 11,30am. 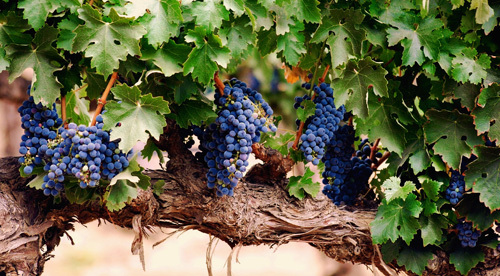 This entry was posted in LFW Your Canberra and tagged Canberra Choral Groups, Canberra jazz, Canberra music, Capital Region Farmers Market, Loriendale Orchard, Merimbula Jazz Festival, Rhythm Syndicate on April 2, 2017 by gracienumber1. It’s JAZZ time on the Sapphire Coast! As well as some fantastic jazz from great performers from Canberra, Victoria, and New South Wales, there are two main features of the Festival this year. 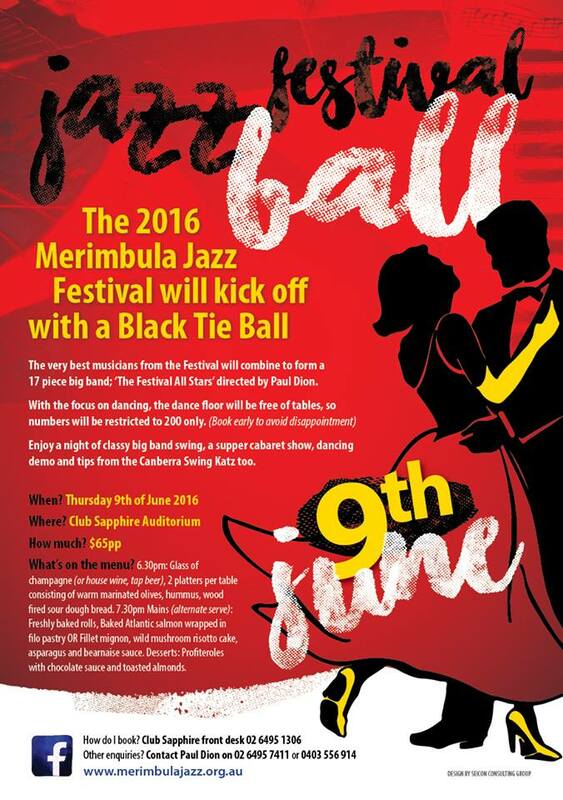 First up is the black tie event; the Jazz Festival Ball on Thursday 9 June at Club Sapphire where you can dance the night away to the Festival All Stars, enjoy a great cabaret show, and relax with a glass of bubbles and yummy three course meal; all included in the ticket price. Bookings for the ball are essential. Another fantastic initiative is the Jazz Quest which has been running for the past four years and has been a huge success. The Quest is open to musicians aged 25 years and under, and its aim is to encourage young and up-coming musicians in the world of jazz, and to help their musical development along with competitive experience. Two of the previous winners include singer Liam Budge, and jazz pianist Kade Brown—both of whom have gone on to huge success and acclaim in their fields, with Kade selected for the Julliard Winter School as both student and mentor. The Quest is held at the Lakeview Hotel at the end of the Saturday night program. Judges usually include five of the top musicians at the Festival who view the performances of each competitor. There are a number of categories including confidence in performance, technical ability, entertainment value, and the ability to perform different styles and instruments through two different performances to show their ability. 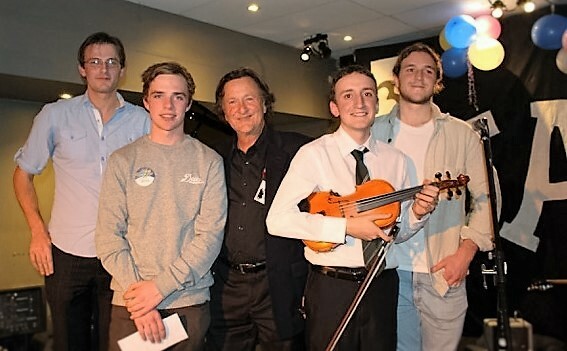 Cash prizes are awarded to the winners, and second and third placements, and both the Quest (and the prize money) goes a long way to help the career of young jazz musicians around Australia. The popular jam session follows the Quest and gives everyone the chance to get on stage and perform with all sorts of musos and singers. If you can keep the pace going until 2am you’re welcome to join in the fun! 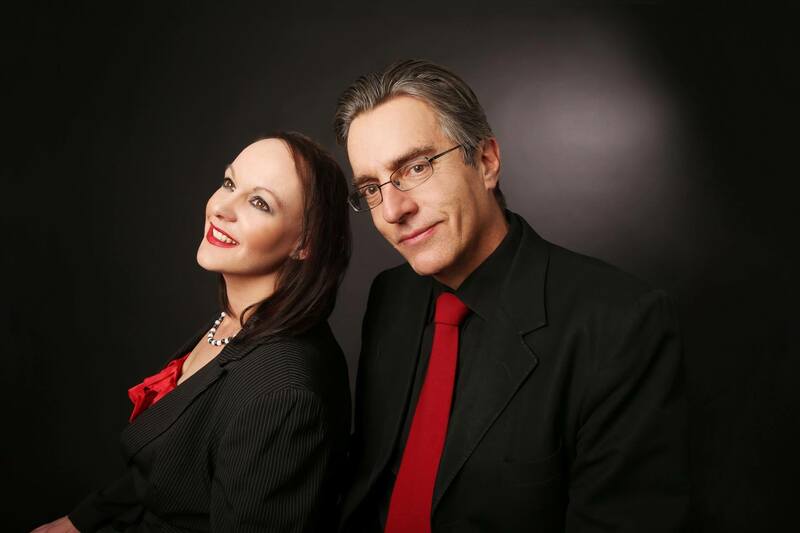 The Jazz Festival runs from Friday night (10 June) until Sunday night at four main venues around the town, and local Canberra acts heading down for the weekend include smooth jazz duo In 2 Deep; check them out if you can. Big bands include Connextion Big Band, In Full Swing, and the Royal Military College Big Band, plus some terrific school bands. Vocal ensembles include Rhythm Syndicate (who also perform at the ecumenical Gospel Church Service on the Sunday), and Shades of Monday, and you can check out some great swing dancing from Canberra Swing Katz. If you like the south coast and you love jazz … what more could you want? 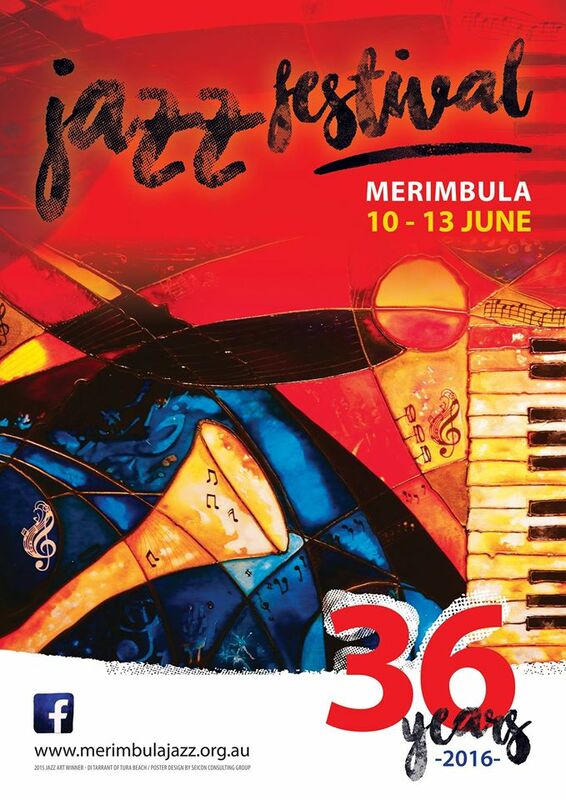 Get more info on the Merimbula Jazz Festival from their website or Facebook page. This entry was posted in LFW Your Canberra and tagged Canberra Choirs, In 2 Deep, Merimbula Jazz Festival, Merimbula Jazz Quest, Rhythm Syndicate, Sapphire Coast, Shades of Monday on May 16, 2016 by gracienumber1.